New Injection Moulded Technology Makes Flares Resistant To Cracks And Cold Canadian WintersWhat is Injection Moulding Technology? "Injection molding" is a manufacturing process that melts plastic and injects it into a mold. It's kinda like a big mechanical syringe filled with hot plastic. It's harder to make injection molded flares but the quality is much, much higher than fender flares made from other methods... 3x Strength, Exact Fitment, Defined ShapeThis YouTube Video Puts Injection Moulded Flares To The Test:More Benefits Of Fender FlaresProduct InfoProtect your truck's ​​​​​​​body paint from rocks that shoot from your tires like a ballistic shield blocking bullets Install onto your truck easily at home without cutting or drilling ​​​​​​​Stop rust from infecting your truck body like a zombie bite Stays strong for years through as much mud, ice, rain, snow and sun that the weather throws at you Customize your truck with a "bolt-on" industrial look (without actually bolting to your truck) ​​​​​​Paintable to match your truck or keep them black so that your truck stands out the way you want it toMade from 3 millimeters of impact-resistant Polypropylene 100% brand new fender flares in original packaging. Four piece set of pocket rivet style fender flares. (2 for front and 2 for rear) Lightly textured black finish UV / Rust Proof Comes with stainless steel bolts, stainless steel nuts, rubber stripping, and all necessary mounting hardware for installation. Full installation instructions are included in the box Ready to be painted or installed as-is. Make Sure Your Flares Fit! These Flares Fit All Makes and Models of 2009 - 2018 Dodge Ram 1500 with the following exceptions: ** Does NOT Fit Dually Models ** Rebel Models need factory flares and mudflaps removed before installation.​​​​​​​ ** Fits 1500 only. 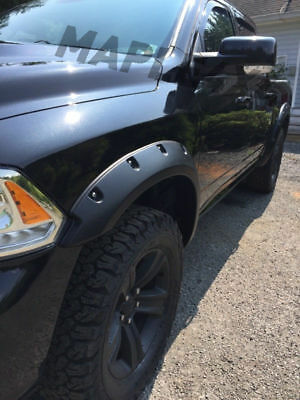 ------> View Our Crack Resistant 2500/3500 Dodge Ram Fender Flares By Clicking Here <------- ​​​​​​​InstallationFull instructions with diagrams are included in the kit, but this is a good overview of the process: ​​​​​​​ 1. Unbox and separate parts. 2. Hold flares up to wheel well to make sure they fit. 3. If there are decals on your truck body that are in the way, remove them now. Youtube has tutorial videos on how to do this. 4. If you are going to paint the flares, do this now. 5. Screw together stainless steel bolts and locking nuts into the pockets of the flare. 6. Push rubber strip onto all edges of the flare that will touch the outside of your truck. This keeps the paint safe. 7. Wash inside of wheel well with soap and warm water 8. Use included adhesive to stick fender flare clips onto the wheel well. 9. Hold flares in place and bolt the flares to the clips. 10. Admire how much better your truck looks. 11. Drive worry-free knowing your truck body is protected from airborne rocks.Shipping We ship most orders within 24 hours of receiving your payment on business days. (Not weekends though... We're trucking through the great outdoors on the weekends.) Most items ship from our main warehouse located in Maple Ridge, BC. We use FedEx Ground as our main shipping method. The transit time is provided by the shipping carrier. You recieve a tracking number with your purchase so you can check exactly where your flares are at any given time. Most orders in Canada arrive in 3-10 business days. If you're in a remote location then it sometimes takes longer. We only ship to Paypal confirmed addresses as recommended for both buyer and seller protection. ​​​​​​​We DO NOT ship to Alaska or Hawaii.RefundsIf the flares arrive to you and there's a manufacturer defect.... We will refund you 100%. Shipping and all. We work our hardest to make sure all customers are fully satisfied with their purchase. If you open them up and just decided you don't want fender flares on your truck we are happy to refund you the price of the item. In this case shipping will be non-refundable. We understand things happen sometimes though (we're human too). Send us an email and we'll work something out. Contact Us With Any Questions!$DESCRIPTION Brand Maple 4x4 Return Policy 30 days, see below for details. Warranty 2 year manufacturer warranty. Makes/Models ---2009 RAM 1500 ---2010 RAM 1500 ---2011 RAM 1500 ---2012 RAM 1500 ---2013 RAM 1500 ---2014 RAM 1500 ---2015 RAM 1500 ---2016 RAM 1500 ---2017 RAM 1500 Style/Color BLACK DESCRIPTION: • Paintable • Made with heat resistant, UV-stable acrylic-capped OEM quality ABS Material • Rubber gasket is included for tight fit • No drill application • All hardware and Stainless Steel Rivets included • Up to 2 inches extra tire coverage to prevent road debris from hitting side of truck SHIPPING All Shipments Most orders will be shipped out of our main warehouse located in Maple Ridge, BC within 48 hours of your payment clearing. The transit time is provided by the shipping carrier based on the item. We only ship to Paypal confirmed addresses as recommended for both buyer and seller protection. We DO NOT ship to P.O. boxes, APO, or FPO. Canada Sales Tax: All Canadian orders are subject to a 12% sales tax. Local BC tax. You will receive your shipment within 10 days of your payment clearing. . RETURN POLICY We offer a 30 day return policy on all items as long as they are returned in their original condition. We will refund the ITEM PRICE only on any unused items. Items must be in original saleable condition. Shipping and handling fees are not refundable. MANUFACTURER'S WARRANTY This product comes with a two (2) year manufacturer's warranty. CONTACT US If you have any questions or comments, please contact us prior to purchasing. Our business phone number is listed below, if our agents are unable to answer please leave a number you can be reached at so we can return your call within 24 hours. Phone +1 (604) 729-3246 ABOUT US Maple 4x4 is a Canadian-based manufacturer and importer of quality 4x4 products. We specialize in grills, lights, and bars for every truck. If you are looking for a specific product for for your truck that is not in our eBay store, please contact us using the information above and we will try to find it for you! New Injection Moulded Technology Makes Flares Resistant To Cracks And Cold Canadian WintersWhat is Injection Moulding Technology? "Injection molding" is a manufacturing process that melts plastic and injects it into a mold. It's kinda like a big mechanical syringe filled with hot plastic. It's harder to make injection molded flares but the quality is much, much higher than fender flares made from other methods... 3x Strength, Exact Fitment, Defined ShapeThis YouTube Video Puts Injection Moulded Flares To The Test:More Benefits Of Fender FlaresProtect your truck's ​​​​​​​body paint from rocks that shoot from your tires like a ballistic shield blocking bullets Install onto your truck easily at home without cutting or drilling ​​​​​​​Stop rust from infecting your truck body like a zombie bite Stays strong for years through as much mud, ice, rain, snow and sun that the weather throws at you Customize your truck with a "bolt-on" industrial look (without actually bolting to your truck) ​​​​​​Paintable to match your truck or keep them black so that your truck stands out the way you want it toProduct InfoMade from 3 millimeters of impact-resistant Polypropylene 100% brand new fender flares in original packaging. Four piece set of pocket rivet style fender flares. (2 for front and 2 for rear) Lightly textured black finish UV / Rust Proof Comes with stainless steel bolts, stainless steel nuts, rubber stripping, and all necessary mounting hardware for installation. Full installation instructions are included in the box Ready to be painted or installed as-is. Make Sure Your Flares Fit! These Flares Fit All Makes and Models of 2009 - 2018 Dodge Ram 1500 with the following exceptions: ** Does NOT Fit Dually Models ** Rebel Models need factory flares and mudflaps removed before installation.​​​​​​​ ** Fits 1500 only. ------> View Our Crack Resistant 2500/3500 Dodge Ram Fender Flares By Clicking Here <------- ​​​​​​​InstallationFull instructions with diagrams are included in the kit, but this is a good overview of the process: ​​​​​​​ 1. Unbox and separate parts. 2. Hold flares up to wheel well to make sure they fit. 3. If there are decals on your truck body that are in the way, remove them now. Youtube has tutorial videos on how to do this. 4. If you are going to paint the flares, do this now. 5. Screw together stainless steel bolts and locking nuts into the pockets of the flare. 6. Push rubber strip onto all edges of the flare that will touch the outside of your truck. This keeps the paint safe. 7. Wash inside of wheel well with soap and warm water 8. Use included adhesive to stick fender flare clips onto the wheel well. 9. Hold flares in place and bolt the flares to the clips. 10. Admire how much better your truck looks. 11. Drive worry-free knowing your truck body is protected from airborne rocks.Shipping We ship most orders within 24 hours of receiving your payment on business days. (Not weekends though... We're trucking through the great outdoors on the weekends.) Most items ship from our main warehouse located in Maple Ridge, BC. We use FedEx Ground as our main shipping method. The transit time is provided by the shipping carrier. You recieve a tracking number with your purchase so you can check exactly where your flares are at any given time. Most orders in Canada arrive in 3-10 business days. If you're in a remote location then it sometimes takes longer. We only ship to Paypal confirmed addresses as recommended for both buyer and seller protection. ​​​​​​​We DO NOT ship to Alaska or Hawaii.RefundsIf the flares arrive to you and there's a manufacturer defect.... We will refund you 100%. Shipping and all. We work our hardest to make sure all customers are fully satisfied with their purchase. If you open them up and just decided you don't want fender flares on your truck we are happy to refund you the price of the item. In this case shipping will be non-refundable. We understand things happen sometimes though (we're human too). Send us an email and we'll work something out. Contact Us With Any Questions! DESCRIPTIONBrandMaple 4x4Return Policy30 days, see below for details.Warranty2 year manufacturer warranty.Makes/Models2009 RAM 15002010 RAM 15002011 RAM 15002012 RAM 15002013 RAM 15002014 RAM 15002015 RAM 15002016 RAM 15002017 RAM 1500Style/ColorBLACK DESCRIPTION: • Paintable • Made with heat resistant, UV-stable acrylic-capped OEM quality ABS Material • Rubber gasket is included for tight fit • No drill application • All hardware and Stainless Steel Rivets included • Up to 2 inches extra tire coverage to prevent road debris from hitting side of truck SHIPPINGAll Shipments Most orders will be shipped out of our main warehouse located in Maple Ridge, BC within 48 hours of your payment clearing. The transit time is provided by the shipping carrier based on the item. We only ship to Paypal confirmed addresses as recommended for both buyer and seller protection. We DO NOT ship to P.O. boxes, APO, or FPO.Canada Sales Tax: All Canadian orders are subject to a 12% sales tax. Local BC tax. You will receive your shipment within 10 days of your payment clearing. . RETURN POLICY We offer a 30 day return policy on all items as long as they are returned in their original condition. We will refund the ITEM PRICE only on any unused items. Items must be in original saleable condition. Shipping and handling fees are not refundable. MANUFACTURER'S WARRANTY This product comes with a two (2) year manufacturer's warranty. CONTACT US If you have any questions or comments, please contact us prior to purchasing. Our business phone number is listed below, if our agents are unable to answer please leave a number you can be reached at so we can return your call within 24 hours.Phone+1 (604) 729-3246 ABOUT US Maple 4x4 is a Canadian-based manufacturer and importer of quality 4x4 products. We specialize in grills, lights, and bars for every truck. If you are looking for a specific product for for your truck that is not in our eBay store, please contact us using the information above and we will try to find it for you!